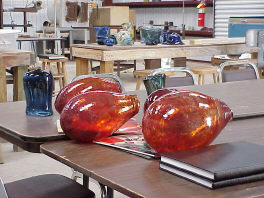 The glass blowing facility was established in 1989 through the Visual Arts Division at Coastal Bend College. 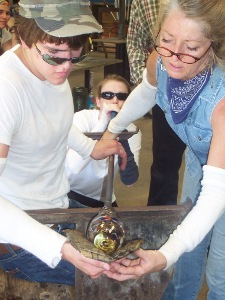 It was the first Junior college to offer this program and has become the oldest academic educational glassblowing facility in the State of Texas. 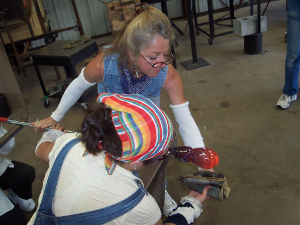 The traditional offhand glassblowing course, ARTS 2371, began in 1990. We have a strong competitive Associate in Arts program, transferable to surrounding Texas colleges and universities. Coastal Bend College seeks to pursue in-depth study in the art of glass by providing you with the most noted teachers and artists. Professor Jayne Duryea, CBC Art Students, and guest artists, 9 am. – 4 pm. Open to all individuals regardless of experience and/or education. in St. Petersburg, Florida for more infomation go here. Last day for glass blowing class enrollment. Join Artist Jayne Duryea in traditional Italian blowing. 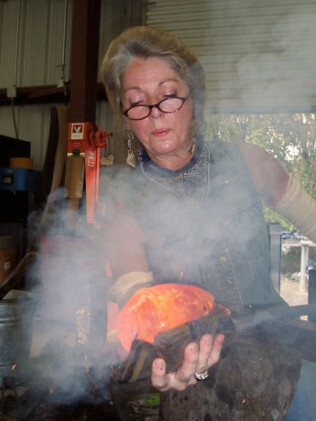 Join Artist Jayne Duryea for glass blowing with the ARS Murano Team. Glassblowing Workshop — Artist-in-Residence Jayne Duryea, CBC Art Students, and guest artists, 9 am. – 4 pm. Open to all individuals regardless of experience and/or education. Fusing Glass Workshop — Artist-in-Residence Jayne Duryea, from 9 am. until 4 pm. Open to all individuals regardless of experience and/or education. Forming molten glass on the end of a blowpipe is an exciting way to experience the essence of this raw material. 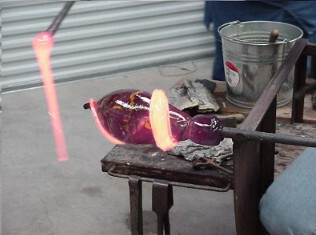 Through lectures and hands-on work, students learn the basic techniques of forming glass: gathering, blowing, and puntying. A survey of kiln techniques including fusing (melting pieces of flat glass together) and slumping (melting flat glass over a three-dimensional object). All projects are developed on an individual basis with emphasis on learning the process for further work. The workshops are available for individuals interested in exploring glass as a media for expression. Participants will be furnished with all supplies and equipment. Meals and Lodging are extra (see listing for motels). Please fill out an application to register for the workshop. Class assignments are made on a first come, first serve basis by postmark or e-mail date. You will be notified promptly by mail or e-mail as to your class status or if you are on the Alternate List. Deposit checks for alternates will be returned as no deposit is required for alternates. You will be notified by phone or e-mail if a vacancy occurs. A deposit of $75 must accompany your registration form in order to hold your place in class. Full tuition must be paid on the first class day to secure your placement. A service fee of $15 will be deducted from all refunds due to cancellations. ALL refunds will be initiated after the last workshop date. Enrollment is limited. Please respond early, early and early. The workshop tuition cost is $275 per class. You will be notified on availability of space and all the details upon receiving your application and the registration deposit of $75 per class. The deposit holds your place on the class list, and is non-refundable upon cancellation. Make check payable to Coastal Bend College Glass. The $200 balance per class will be due on first day of workshop. 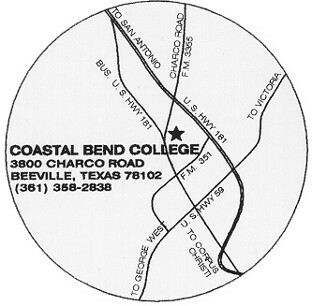 Coastal Bend College is located at the intersection of Business Hwy 181 and FM 3355 (Charco Road) in Beeville, Texas. From the US Hwy 181 bypass, exit at FM 3355, turn west on FM 3355 and travel for approximately one mile. The Frank Jostes Visual Arts Building is located on the left at top of the hill next to the second parking lot. Please arrange your own reservation.